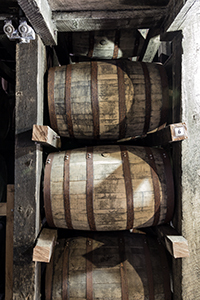 July 22, 2014 – For the first time since 1977, Kentucky’s Bourbon distillers have more than 5 million barrels of maturing whiskey stored in their warehouses around the Bluegrass State. Figures released today by the Kentucky Distillers Association put the total number of Bourbon barrels in bonded storage at 5,294,988 as of December 31, 2013. When combined with maturing barrels holding American whiskey, brandy, and other spirits, around 5.9 million barrels of distilled spirits are currently maturing in the state’s warehouses. The data covers all of the state’s distillers and rectifiers, not just those who are members of the KDA. The state’s distillers filled 1.2 million barrels with new “white dog” spirit during 2013, the most in a single year since 1970, as the Bourbon boom has generated new interest and demand worldwide. In a news release, KDA President Eric Gregory noted that the value of barrels in bonded storage has nearly doubled since 2006 to around $1.9 billion (USD). Earlier this year, state lawmakers approved a tax credit for distillers allowing them to deduct the ad valorem taxes paid on each barrel of maturing spirit from their corporate income taxes, as long as the credits are reinvested on construction and other capital expenses within the state. Distillers paid more than $15 million in ad valorem taxes in 2013 to local governments and school districts. The KDA also reported a new record for visitors along the Kentucky Bourbon Trail, with 630,000 people visiting at least one of the Trail’s member distilleries during 2013.